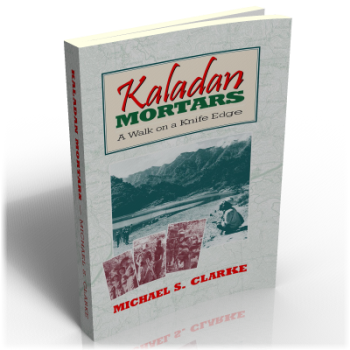 Kaladan Mortars is about the mortar battery with which Michael Clarke saw action in Burma in 1944-45. It describes in detail the conditions, climate and terrain through which they fought; the long march in, the campaign, the capture of Myohaung, and then the long march out again to Buthidaung. It was not a spectacular campaign, hardly raising a comment in the press at the time or no more than a few lines in most official accounts. The Division, of which they were part had no vehicles, so they all marched, carrying their arms and supplies on a head-loaded basis. The objective of this book is both to record the activities of a minor unit of the Forgotten 14th Army, and to salute the important part played by the African soldiers, whose courage, humour and endurance contributed so much to the hard slog through Burma's inhospitable hills, and the ultimate defeat of the Japanese. The author left the Battery soon after the end of the campaign on promotion, to command the Gunner Wing of the WA Training Camp in India, while the Battery returned to Nigeria at the end of the war to be disbanded. They never fought again with the British Army.